Every time a blonde has an ideia, someone die. ...and God gave her brains. "that might be funny if you spelt idea right" That might be true if you spelled 'spelled' right. everytime a blonde has an idea, someone dies! I am a blonde and at least I can SPELL. Idea*, dies*. How did that comment get top rated? "That might be true if you spelled 'spelled' right." That might be true if you knew that spelt was an actual word. Every time a blonde has an idea, someone dies. You know the song:Do you believe in magic...In a young girl's HEAD???? "That might be true if you knew that spelt was an actual word." Yes it is a word, but it is a type of wheat. Quantum Physicist- "Blonde? With an idea? But that's impossible... OH SHIIII-------"
Pikachu used thunderbolt! Wild Arceus fainted! Bet you 50$ that the person who made the top caption was the blond in the picture. GOD's aim was wide off the mark. I actually love the bad grammar, syntax and spelling in the top comment. It makes it so much funnier. ""that might be funny if you spelt idea right" That might be true if you spelled 'spelled' right." that might be true if it wasnt spelt correctly in the first place. idiot. For the Second Coming, God upped the ante. 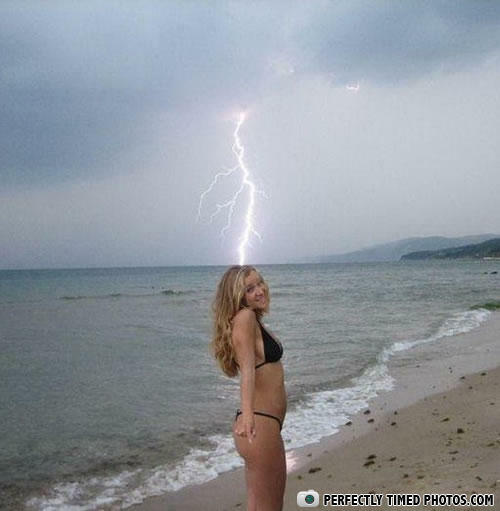 People said she was 'electrifying'! you know whats funny that her head is so flat that it connects with the sea and also what are the chances aof it hitting there and taking a photo of it! Nobody doesn't like Sarah Lee.